ElasticDocs is a proprietary machine learning platform for unstructured data enabled with state of art search-and-cluster technology. It is pre-trained on hundreds and thousands of texts, images, and multi-formatted geosciences data. ElasticDocs specializes in the handling of geological documents such as pdf, doc, docx. It converts unstructured information into structured information through carefully selected sequences of machine learning algorithm such as Optical Character Recognition (OCR) for digitalization, Natural Language Processing (NLP) for contextual understanding and full text search, and Deep Convolutional Neural Network (DCNN) for autoimage classification of multiple image classes, including seismic, thin sections, and cores, among others. It is also equipped with GIS layers to geolocate information and provide understanding on the availability, or scarcity of information, within a particular area. ElasticDocs is particularly designed to enable geoscientists to browse through thousands of pages of reports in seconds, and find geological analogs thru sophisticated, pioneering search-and-cluster techniques engineered by Iraya’s team of machine learning specialists and earth scientists. On top of a bundle of sophisticated algorithms, ElasticDocs is built with interactive, user-friendly interface that brings the value of machine learning to the oil & gas industry, as a functional and web-based software, that can be accessed by multiple users, anytime, anywhere. Its microservices architecture also allows users to build extendible API on top of the ElasticDocs platform, so that each functionality, current and future, is practically its own separate apps. Spend less time searching with ElasticDocs. More time revealing the unseen. 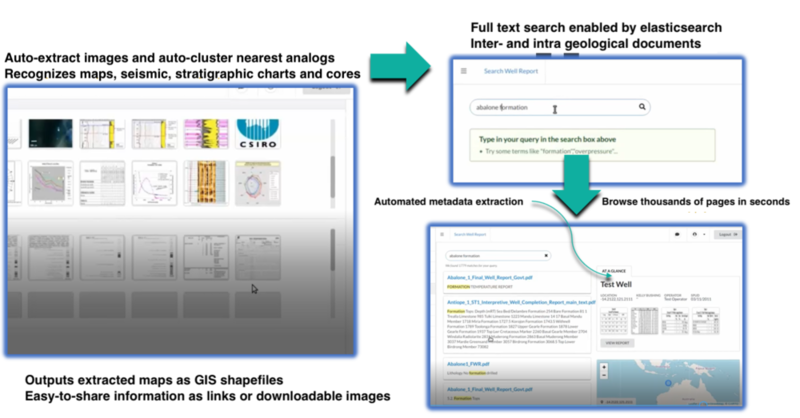 Iraya's ElasticDocs allows for global elastic text search in a corpus of well reports, making it much easier to find information like: Which wells contain sandstone? What depth is this formation? 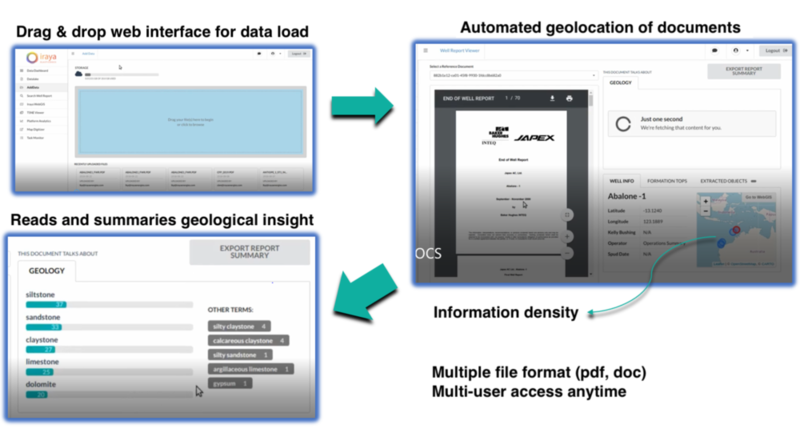 The ElasticDocs platform utilizes a hybrid data service architecture that is flexible, and allows it to be installed in a fully-cloud, fully on-premise, or a hybrid environment - as our client, the choice is yours. Hear more about ElasticDocs, as we discussed it at the FORCE Machine Learning Symposium 2018 in Stavanger, in the video here.